It's time again for another Lawn Fawn Inspiration Week! We are continuing to feature some of the newest products from the Winter 2015 CHA release. 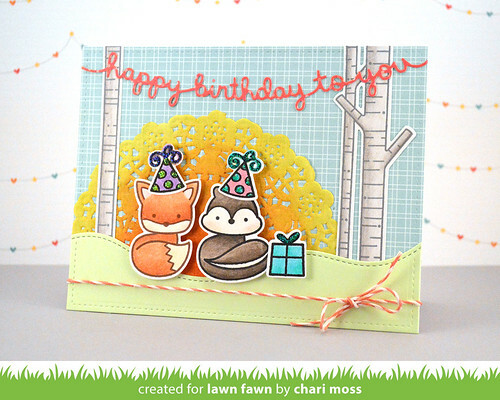 Today we are highlighting the newest edition to the birthday mini sets, Year Five and the Happy Birthday border die. 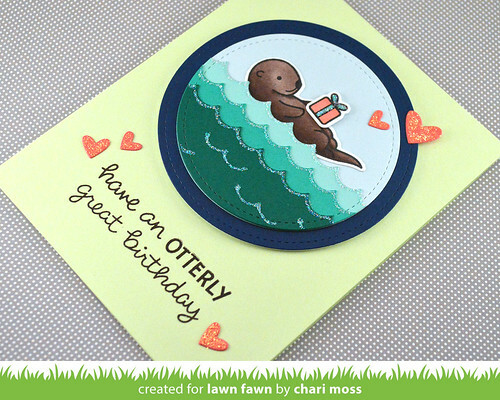 I absolutely love this sweet little otter and the punny sentiment is perfect! I created my waves buy using the scalloped border die and verigated colors of card stock. I used the stitched circles to create the little portal frame and sprinkled some heart die cuts around to finish it off. My second card features the Happy Birthday border die. I think this die would be great to make some clean and simple birthday cards but for this card I used it to create a banner element for my little critter party. I used a white doily and inked it with distress inks to create a the sun like element in the background and the trees from Joy to the Woods frames the little scene perfectly. I colored the little critters from Into the Woods with colored pencils and added party hats from Hats Off To You. 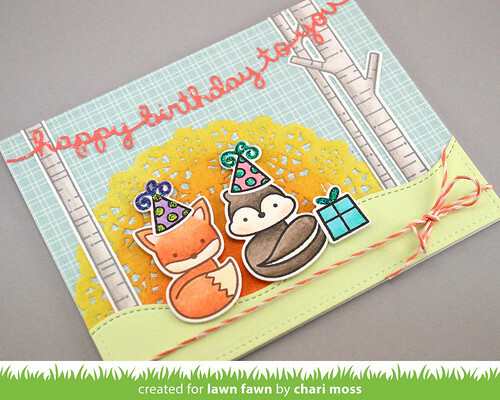 Be sure to check out the Lawn Fawn blog for more projects with the birthday border die and Year Five. I hear there are giveaways going on there as well. Two fabulous cards Chari!! TFS! Sweet cards! 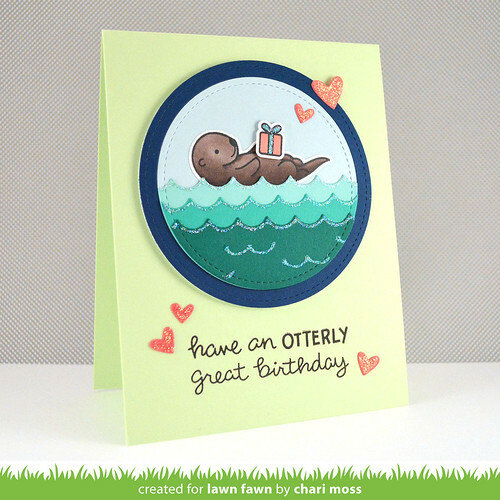 I love the wonderful colors you used on the otter card and the fun scene you created with the doily on your second one! TFS! Cute cute cards! Love how you used the doily as the sun! Oh my word Chari. Your cards are so, so sweet! Fabulous cards! Love your doily sun!